How to locate Properties in your Java API? 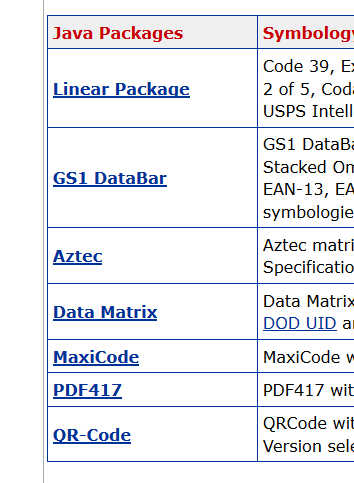 I need to generate 2D barcodes (Data Matrix) in Oracle Reports 10g using your Java Component but your Java/Oracle reports tutorial is for Linear (1D) barcodes. Some of your properties in the example are only valid for your LinearBarCode.jar. How can we find a list of properties for your other jar files? To access the API for a specific jar file, view the Product Information tab on the Java Component page. (1) Select the Java package API link to use. (2) On the left side of the page in the All Classes section, select the symbology. 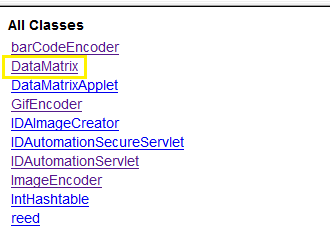 To view Data Matrix properties and methods, select Data Matrix. 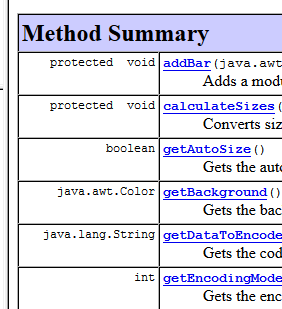 (3) Scroll down to Method Summary and look for the methods that use set such as setDataToEncode.